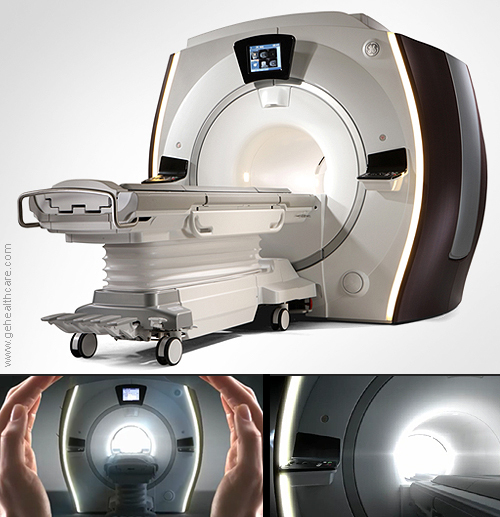 GE Discovery MR750w 3.0T Magnetic Resonance Imaging. Keeping the patients comfort in mind, the Discovery MR750w features an innovative patient-friendly design inspired by the caring hands metaphor of protection. The unexpected use of materials such as wenge wood and the parenthesis accent lights on the sides can help to ease the anxiety that many patients feel during imaging. The 3.0T scanner has a 70cm-flared patient bore and it is available with the GEM Suite (Geometry Embracing Method) that includes feet first imaging for all anatomies and flexible coils to improve patient comfort by reducing the need for repositioning. More features are noise reduction technology (ART), 44/200 high performance gradients, full 50 cm FOV, and MultiDrive RF Transmit for excellent RF homogeneity and signal homogeneity regardless of patient shape, size or body habitus.